Durability begins with a quality product. Lagerwey's newest generation of direct drive turbines is ready for the future and is challenging the old concepts in many aspects. 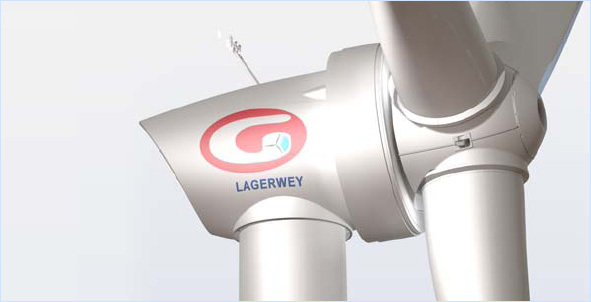 Lagerwey's long experience and innovative mind regarding direct drive technology has resulted in an optimal next generation turbine called the GWP82-2000kW. Reducing the amount of components and design simplicity are essential drivers in making durable quality. The turbine has a permanent magnet generator with excellent efficiency in partial and full load. Together with a full power converter we are able to deliver a clean, grid friendly power even during worst case circumstances. Due to the variable speed principle, the turbine is the best choice when conditions get rough. An advanced electrical pitch system reduces the loads and guarantees maximum energy capture. The only moving part with a high load cycle is the main bearing into which Lagerwey has deliberately engineered a comfortable safety margin regarding wear and loads. The automatic lubrication system is closely monitored and is very accessible for maintenance. The GWP82-2000kW has a hollow main shaft for direct internal access to the hub. This makes the design light together with high stiffness to withstand the loads. All service can be done comfortably from the inside of the turbine. The generator is closed from outside influences and has an efficient passive cooling system that makes it withstand the most severe environments (dust, coastal operation etc.). Transportation and installation costs have become major costs in the multi megawatt turbine class. Our concept with ready to fit assembly modules ensures low installation costs and requires minimal crane capacity. The turbine can be erected with a 500 tonne mobile crane. The GWP82-2000kW energy capture is very high, especially where it matters, in partial load. In partial load the turbine outperforms the existing drive train concepts by far. Design margins and low installation and maintenance costs make the turbine a low risk investment and combined with the excellent energy capture allows for an attractive return on investment. This is the turbine of choice for your projects. Full Service means that we GWP retains all internal technical risks for the product, such as spare parts, labour and consumables. Also included is an availability warranty and costs are based on a price per kwh produced. GWP offers a first class quality product in combination with a Full Service Agreement that reduces your risks to a minimum. GWP's solid financial position as a part of the Reliance ADA Group means you can have confidence in the service offer.